Shah Jahan was the fifth ruler of the Mughal dynasty. During his third regnal year, his favorite wife, known as Mumtaz Mahal, died due to complications arising from the birth of their fourteenth child. Deeply saddened, the emperor started planning the construction of a suitable, permanent resting place for his beloved wife almost immediately. The result of his efforts and resources was the creation of what was called the Luminous Tomb in contemporary Mughal texts and is what the world knows today as the Taj Mahal. In general terms, Sunni Muslims favor a simple burial, under an open sky. But notable domed mausolea for Mughals (as well as for other Central Asian rulers) were built prior to Shah Jahan’s rule, so in this regard, the Taj is not unique. The Taj is, however, exceptional for its monumental scale, stunning gardens, lavish ornamentation, and its overt use of white marble. Shah Jahan built the Taj Mahal in Agra, where he took the throne in 1628. First conquered by Muslim invaders in the eleventh century, the city had been transformed into a flourishing area of trade during Shah Jahan’s rule. Situated on the banks of the Yamuna River allowed for easy access to water, and Agra soon earned the reputation as a “riverfront garden city,” on account of its meticulously planned gardens, lush with flowering bushes and fruit-bearing trees in the sixteenth century. Entry to the Taj Mahal complex via the forecourt, which in the sixteenth century housed shops, and through a monumental gate of inlaid and highly decorated red sandstone made for a first impression of grand splendor and symmetry: aligned along a long water channel through this gate is the Taj—set majestically on a raised platform on the north end. The rectangular complex runs roughly 1860 feet on the north-south axis, and 1000 feet on the east-west axis. The white-marble mausoleum is flanked on either side by identical buildings in red sandstone. One of these serves as a mosque, and the other, whose exact function is unknown, provides architectural balance. The marble structure is topped by a bulbous dome and surrounded by four minarets of equal height. While minarets in Islamic architecture are usually associated with mosques—for use by the muezzin who leads the call to prayer—here, they are not functional, but ornamental, once again underscoring the Mughal focus on structural balance and harmony. The interior floor plan of the Taj exhibits the hasht bishisht (eight levels) principle, alluding to the eight levels of paradise. Consisting of eight halls and side rooms connected to the main space in a cross-axial plan—the favored design for Islamic architecture from the mid-fifteenth century—the center of the main chamber holds Mumtaz Mahal’s intricately decorated marble cenotaph on a raised platform. The emperor’s cenotaph was laid down beside hers after he died three decades later—both are encased in an octagon of exquisitely carved white-marble screens. The coffins bearing their remains lie in the spaces directly beneath the cenotaphs. Some of the Taj Mahal’s architecture fuses aspects from other Islamic traditions, but other aspects reflect with indigenous style elements. In particular, this is evident in the umbrella-shaped ornamental chhatris (dome shaped pavillions) atop the pavilions and minarets. 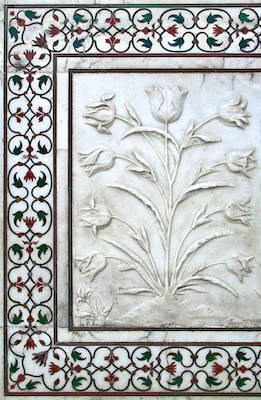 And whereas most Mughal-era buildings tended to use red stone for exteriors and functional architecture (such as military buildings and forts)—reserving white marble for special inner spaces or for the tombs of holy men, the Taj’s entire main structure is constructed of white marble and the auxiliary buildings are composed of red sandstone. This white-and-red color scheme of the built complex may correspond with principles laid down in ancient Hindu texts—in which white stood for purity and the priestly class, and red represented the color of the warrior class. 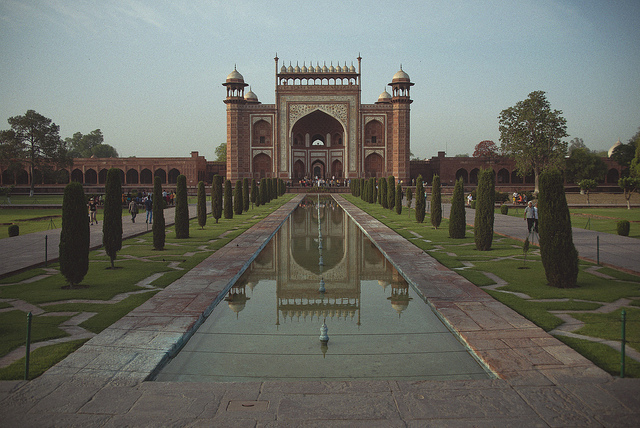 Stretching in front of the Taj Mahal is a monumental char bagh garden. Typically, a char bagh was divided into four main quadrants, with a building (such as a pavilion or tomb) along its central axis. When viewed from the main gateway today, the Taj Mahal appears to deviate from this norm, as it is not centrally placed within the garden, but rather located at the end of a complex that is backed by the river, such as was found in other Mughal-era pleasure gardens. When viewed from the Mahtab Bagh, moonlight gardens, across the river, however, the monument appears to be centrally located in a grander complex than originally thought. This view, only possible when one incorporates the Yamuna River into the complex, speaks to the brilliance of the architect. Moreover, by raising the Taj onto an elevated foundation, the builders ensured that Shah Jahan’s funerary complex as well as the tombs of other Mughal nobles along with their attached gardens could be viewed from many angles along the river. The garden incorporated waterways and fountains. This was a new type of gardening that was introduced to India by Babur, Shah Jahan’s great great grandfather in the sixteenth century. 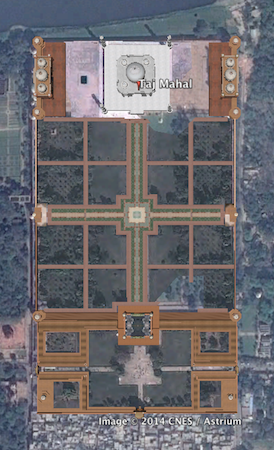 Given the passage of time and the intervention of many individuals in the garden since its construction, it is hard to determine the original planting and layout scheme of the garden beds at the Taj. From the outset, the Taj was conceived of as a building that would be remembered for its magnificence for ages to come, and to that end, the best material and skills were employed. 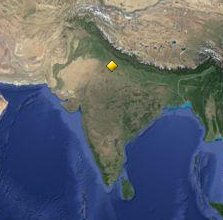 The finest marble came from quarries 250 miles away in Makrarna, Rajasthan. Mir Abd Al-Karim was designated as the lead architect. Abdul Haqq was chosen as the calligrapher, and Ustad Ahmad Lahauri was made the supervisor. Shah Jahan made sure that the principles of Mughal architecture were incorporated into the design throughout the building process. 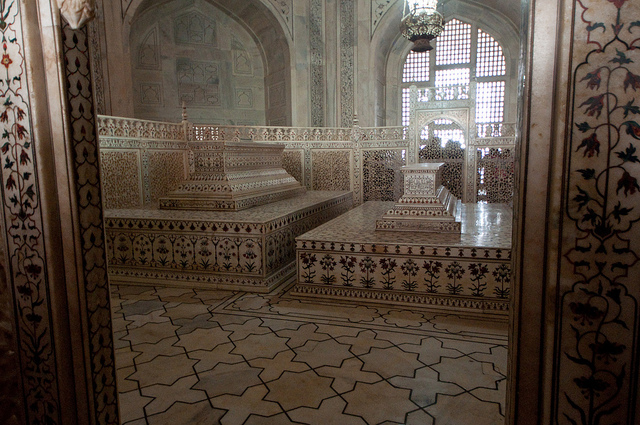 When Mumtaz Mahal died at age 38 in 1631, the emperor is reported to have refused to engage in court festivities, postponed two of his sons’ weddings, and allegedly made frequent visits to his wife’s temporary resting place (in Burhanpur) during the time it took for the building of the Taj to be completed. 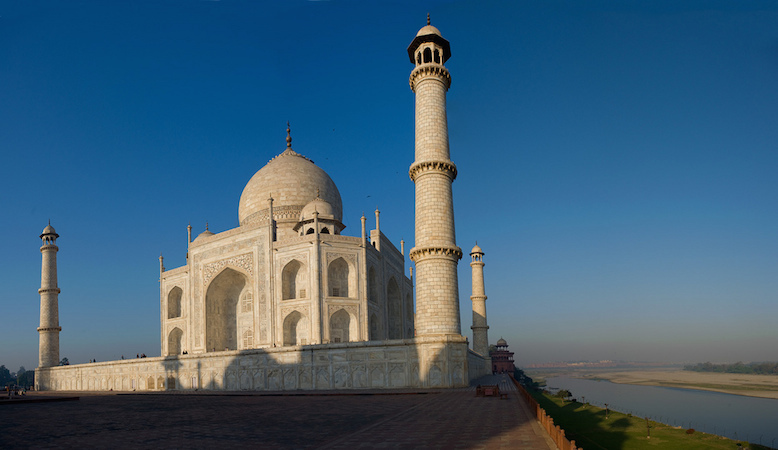 Stories like these have led to the Taj Mahal being referred to as an architectural “symbol of love” in popular literature. But there are other theories: one suggests that the Taj is not a funeral monument, and that Shah Jahan might have built a similar structure even if his wife had not died. Based on the metaphoric specificity of Qur’anic and other inscriptions and the emperor’s love of thrones, another theory maintains that the Taj Mahal is a symbolic representation of a Divine Throne—the seat of God—on the Day of Judgment. A third view holds that the monument was built to represent a replica of a house of paradise. In the “paradisiacal mansion” theory, the Taj was something of a vanity project, built to glorify Mughal rule and the emperor himself. If his accession to the throne was smooth, Shah Jahan’s departure from it was not. The emperor died not as a ruler, but as a prisoner. Relegated to Agra Fort under house arrest for eight years prior to his death in 1666, Shah Jahan could enjoy only a distant view of the Taj Mahal. But the resplendent marble mausoleum he built “with posterity in mind” endures, more than 350 years after it was constructed, and is believed to be the most recognizable sight in the world today. Laid to rest beside his beloved wife in the Taj Mahal, the man once called Padshah—King of the World—enjoys enduring fame, too, for having commissioned the world’s most extravagant and memorable mausoleum. 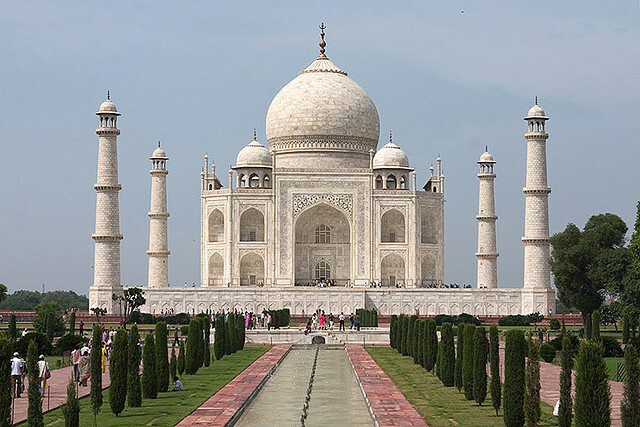 The Taj Mahal is one of the world’s great tourist attractions, hosting millions of visitors per year. Though it was designated as UNESCO World Heritage Site in 1983 and is currently overseen by the Archaeological Survey of India, its heavy visitor traffic is just one of the many factors that threaten the integrity of the site. One of the biggest risk factors for the Taj Mahal is air pollution, which discolors the exterior and, some experts think, causes acid rain that deteriorates the marble. Air pollution is caused by a multitude of factors including industry, vehicle emissions, and the burning of household waste. 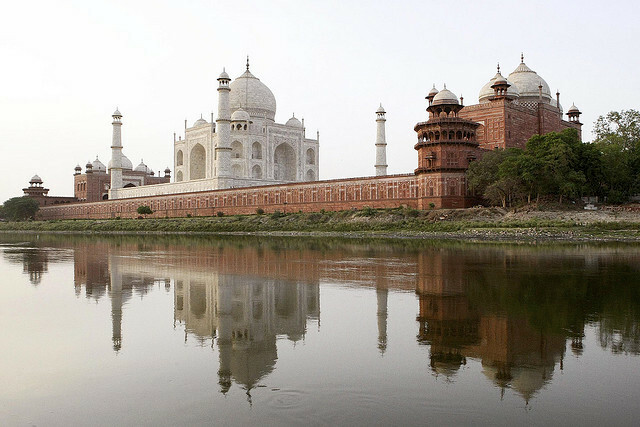 The government of India designated an area called the Taj Trapezium Zone (named for its trapezoidal shape), a 10,400 square kilometer swath (about 4,000 square miles) of Agra encompassing the Taj Mahal as well as the Agra Fort and the historic Mughal settlement of Fatehpur Sikri. Oil refineries and coal-burning industries have been ordered to regulate their emissions or switch to natural gas within this zone, and most have complied. There has also been a ban on auto traffic near the Taj Mahal, air quality monitors have been installed, and the Archaeological Survey of India has proposed a tourist cap and increased fees to limit visitor impact. The physical fabric is in good condition and structural stability, nature of foundation, verticality of the minarets and other constructional aspects of Taj Mahal have been studied and continue to be monitored. 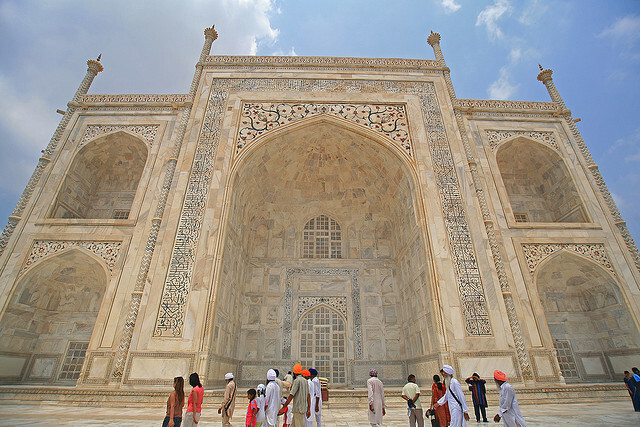 The Taj Mahal is rightly a top destination for millions of travelers. As global tourism grows and the economic pressures of industry continue to increase, the authorities who oversee the site must strive to implement legal and structural measures to ensure that this irreplaceable monument survives. Baburnama: Memoirs of Babur, Prince and Emperor, translated, edited and annotated by Wheeler M. Thackston (Oxford University Press, 1996). Milo C. Beach and Ebba Koch, King of the World: The Padshahnama, with new Translations by Wheeler Thackston (Thames and Hudson, 1997). Wayne Begley, “The Myth of the Taj Mahal and a New Theory of its Symbolic Meaning,” Art Bulletin, vol 61, no 1, March 1979, pp. 7-37. Vidya Dehejia, Indian Art (Phaidon, 1997). Ebba Koch, Mughal Architecture: An Outline of its History and Development (1526-1858) (Neues Publishing Company, 1991). ______, The Complete Taj Mahal and the Riverfront Gardens of Agra (Thames and Hudson, 2006). ______, “The Taj Mahal: Architecture, Symbolism and Urban Significance,” Muqarnas, vol. 22, 2005. George Michell, George and Amit Pasricha, Mughal Architecture and Gardens (Antique Collectors’ Club, 2011). D. Fairchild Ruggles, “A Garden in Landscape,” in Islamic Gardens and Landscapes: Penn Studies in Landscape Architecture (University of Pennsylvania Press, 2007). Giles Tillotson, Taj Mahal (Harvard University Press, 2008). Cite this page as: Roshna Kapadia, "The Taj Mahal," in Smarthistory, August 9, 2015, accessed April 22, 2019, https://smarthistory.org/the-taj-mahal/.